Implantology is an area of dental medicine that deals with repairing defects in the rows of teeth through placement of implants. Dental Implants can be used to treat all defects – from the loss of a single tooth to the loss of all teeth. 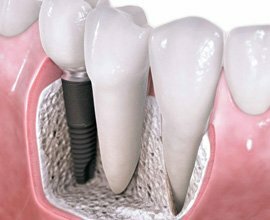 Implants are titanium analogues of the roots of teeth. Titanium is a biocompatible material, which means that it is integrated into the bone structure without causing inflammation or being rejected. 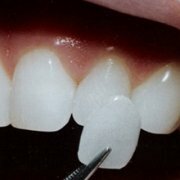 Unlike prosthetic dentistry, implantology allows the replacement of a missing tooth without having to file down those adjacent to it. With implants, the levels of bone in the jaws are retained and bone loss over time is minimised. The implant placement procedure is minimally invasive and starts with an initial examination. 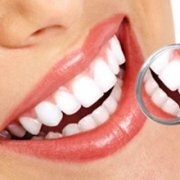 During this examination, the dentist prepares a final treatment plan, makes an impression of the jaws and, if necessary, schedules further tests, such as x-rays, blood-work, etc. Once all necessary paraclinical information has been collected, it is time to determine the type and number of implants and proceed to the surgical stage of the treatment. The implantation procedure is minimally invasive and is usually performed under local anaesthetic. 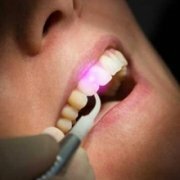 For your comfort and peace of mind, we at IG Dental also offer general/full anaesthetic for the performance of this procedure. After the implant’s placement, you have to wait for its osseointegration, which takes 2-6 months. 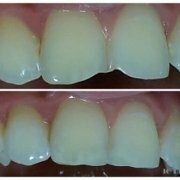 After the implant’s ossification, it is time to proceed to the placement of a crown. It is made in a dental technician laboratory according to individual models of both of your jaws to ensure harmony between the teeth and the jaws. 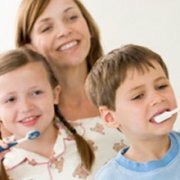 Proper oral hygiene and care on your part makes for a lasting, secure and effective implantological treatment.